Every person acquires a worldview, a picture of reality. Within that picture, the existence of some things will be taken wholly for granted as the background to, and support of, everything else. Their existence will rarely be questioned. The cosmos or universe, the gods, God, Brahman, Heaven, the Absolute--R. T. Allen claims that all these and other world- views have been held to be that which necessarily exists and upon which all other beings depend in one way or another.European philosophers, since antiquity, have offered arguments to show that their chosen candidates for the role of the necessary being or beings that support the rest of reality do actually exist. 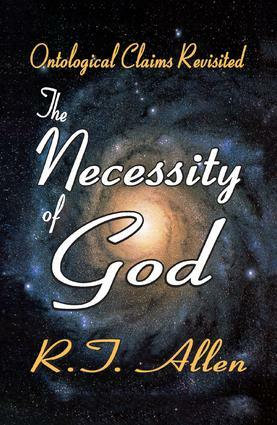 The Necessity of God sets the valid core of previous ontological arguments. It does not and cannot prove that God exists, but only that something necessarily exists. In an a priori manner and without inferring anything from what in fact exists, Allen proceeds to show that which necessarily exists is one, transfinite, eternal, and the archetype of personal existence: in short, that it is God as classically conceived. As for everything else that may exist, it must be finite and dependent for its existence upon God as its creator and sustainer.Few things are more erroneous in philosophy and disastrous in practice than artificial constructions produced without constant reference to concrete reality. That which necessarily exists may be the one exception. Before this constructive argument, Allen examines previous examples of ontological arguments in order to show exactly where they go wrong and to extract the valid core obscured within them. This will make clear the difference between them and his new version. The reader who is eager to engage the philosophical sources of belief will find a distinct treasure in The Necessity of God.